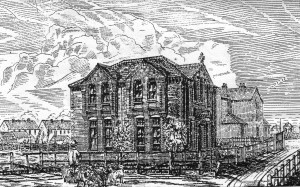 The village primary school is the earliest of this Victorian group; it was opened in 1843 and built on land given by the Lord of the Manor, Walter Francis 5th Duke of Buccleuch. 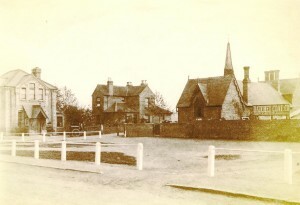 Its foundation deed, dated 1844, states that the school is to be under the management, control and inspection of the Vicar of the parish and to be used for the purpose of educating the children of poor persons resident in the Parish according to the Principles of the Established Church of England. It was due to the Reverend Isaac Gossett that funds were raised for the building. The Windsor Express on 20th November 1843 announced that: The Infant School at Datchet was opened for the free instruction of the poor of that village. The Inhabitants feel themselves greatly indebted to the Rev. Isaac Gossett for the establishment of this charitable organisation, through whose strenuous exertions, aided by the liberal donations of the local gentry, so laudable and desirable an object has been accomplished. Reverend Gossett is now remembered every year at the school’s Founder’s Day celebrations. At first there was just one schoolroom and a two-storey house for a schoolmistress, but in almost every decade since its foundation there have been rooms added, as well as new windows, heating systems or improved access. The room fronting the Green dates from the 1860s and the last room to be added in Victorian times was at the far end, at a higher level than the rest of the school due to devastating floods in 1894; this was the only part of the building which was not flooded in 1947. 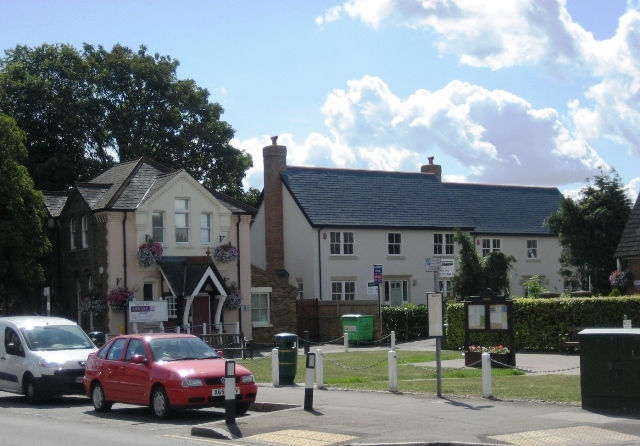 Major developments in the form of remodelling to bring the premises up to date have taken place several times, notably in the 1920s when the school was threatened with closure if comprehensive improvements were not carried out; funds were raised locally and it was saved. By the 1960s it was again sub-standard and two new rooms were added along with another complete internal renovation. The most recent classrooms date from the 1980s and 90s, while an almost continuous programme of work ensures that facilities are of the highest standard. 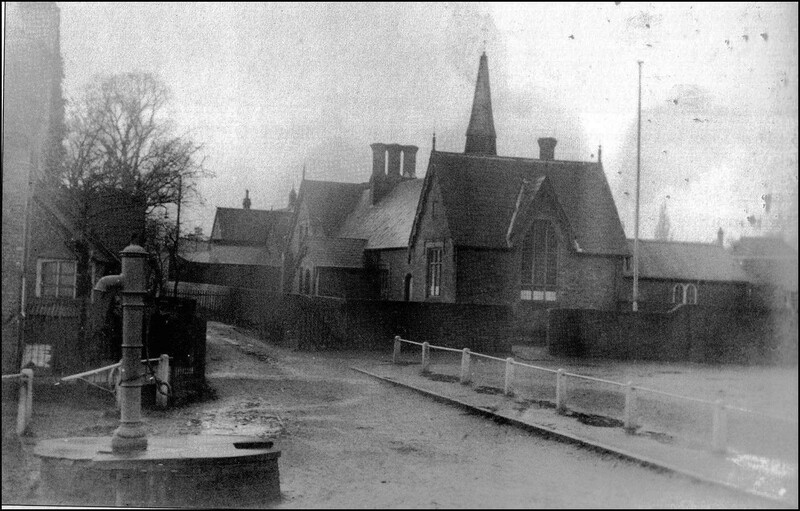 The building now rambles a very long way back from its narrow village frontage, often perplexing visitors, but now full of happy, purposeful and high-achieving local children. In 2013 the school achieved Academy status and Janet Kennish wrote From Village School to Primary Academy for the School’s children. 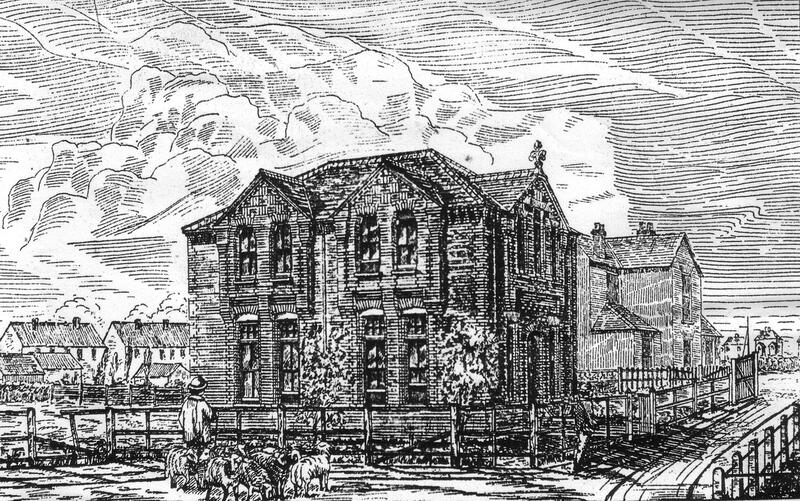 Working Men’s Club 1881 with farmhouse on R and Green Lane cottages on L.
The club was also built on land given by the Duke of Buccleuch in 1881. It was built by public subscription and intended to contribute to the welfare of the working classes; in particular to provide a place where educational and improving leisure activities were available. 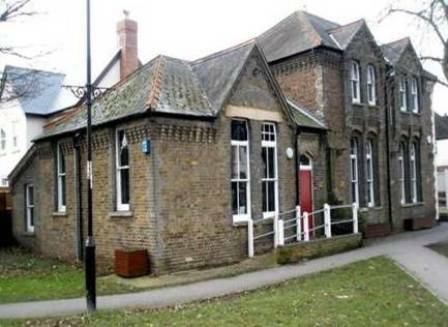 In 1887 lady Needham provided another room at the back of the building as a village hall and this a played a central role in the life of the village until recent times. The ground floor has now been successfully converted to a branch library, with a police outpost upstairs, giving the original building a new community purpose in this prominent village location. The farmhouse (derelict for many years and now demolished) was built in 1875. In that year the Goodwin family’s property was sold at auction due to disputed inheritance. The widow Sarah Tarrant was the last tenant of the Goodwins at the farmstead on the site of modern Hall Place (north side of the Greens) which was being sold. She took the opportunity at auction to buy a piece of their land at and built the farmhouse from which she ran a dairy business together with her Tarrant nephews and nieces. By 1891 it had been inherited by Philip S Tarrant, a gravel-digger and gardener who was also the church organist. It has recently been sold for housing development.